Grammy award winning platinum recording star and big screen actor Common is set to release his highly anticipated eighth (8th) studio album, Universal Mind Control (UMC) on December 9th on G.O.O.D Music/Geffen Records. Universal Mind Control follows last summer's release Finding Forever which debuted at number one (#1) on the Billboard 200. The techno-inspired club banger, Universal Mind Control, presents a fresh sound and change of direction for the Chicago-bred musician. 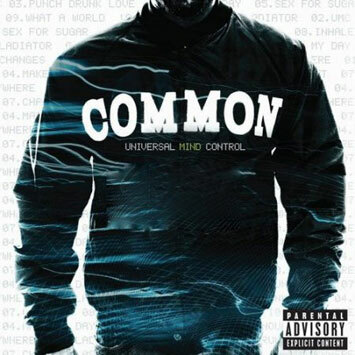 Common created Universal Mind Control because he felt the feel-good music was the only music missing from his body of work. "I've always been passionate about what I do," says Common. "I put my heart into Universal Mind Control, and I think it'll reach audiences I've never touched before." With every new release Common is able to gain the eyes and ears of an entirely new audience. The artist began his career with stimulating lyrics in his 1992 debut, Can I Borrow a Dollar?, and subsequent release Resurrection. One Day It'll All Make Sense introduced Common to the neo-soul/bohemian crowd, Like Water for Chocolate solidified his position with the next generation of soul musicians, and the adventurous Electric Circus saw Common expand his horizons even more. Be and Finding Forever, resulted in classic, soulful albums that would garner four Grammy nominations for Be and a Grammy Award for Finding Forever. To promote Universal Mind Control Common produced two videos: one a high tech futuristically looking piece shot with a modern and sleek fashion sensibility for the high energy title track "Universal Mind Control" and the other a ground-breaking piece for "Announcement," which features state of the art post effects and should be available right around the album release date. Both videos are directed by Hype Williams and both songs are produced by and feature Pharrell. Produced by The Neptunes and Mr. DJ (of Outkast fame), Universal Mind Control hosts a number of fun-filled tracks including "Make My Day," a sunny hip-hop version of "California Girls" with a Cee-Lo hook, and "Everywhere," an upbeat duet that draws its guitar riff from Pat Benatar's "Love Is A Battlefield." The Chicago MC manages to remain true to his roots with "What A World," a story that is based on Common's journey of overcoming long odds to find success that features a catchy hook by pop duo Chester French and "Changes," an optimistic look at the future that pays homage to President Elect Barack Obama. The first single, the title track and Afrika Bambaataa-influenced "Universal Mind Control" is #2 most added at urban radio this week (Source: R&R's "Urban National Airplay" chart) and is featured in a Zune commercial that Common appears in alongside Bambaataa. The commercial appears on TV and online. Early praise on Universal Mind Control includes reviews from outlets such as Rolling Stone who says UMC has "hyperspeed dance-floor jams spiced up with futuristic effects and deft lyrics," while Entertainment Weekly states that Universal Mind Control is "packed with flashy synths and catchy hooks." To complement the new release, Common has launched a new website, thinkcommon.com. Thinkcommon.com was designed and developed by Fishbucket and will serve as the main hub for any fan who wants to keep up-to-date on Common's life, music, films, and beyond. Common has been a mainstay in the entertainment business for sixteen (16) years. He recently made the transition to film and has starred in five (5) major films with incredible stars including: Smokin' Aces directed by Joe Carnahan starring Jeremy Piven and Ben Affleck and American Gangster directed by Ridley Scott starring Russell Crowe and Denzel Washington in 2007, Street Kings directed by David Ayer starring Forest Whitaker and Keanu Reeves and Wanted directed by Timur Bekmambetov starring Angelina Jolie and Morgan Freeman in 2008. In May of 2009 we will catch Common starring in Terminator Salvation directed by McG and also starring Christian Bale. He has also written three children's books -- one having won a NAACP Award, has a youth empowerment foundation (The Common Ground Foundation -- http://www.commongroundfoundation.org/), and he has enjoyed being a part of commercial endorsement campaigns for Lincoln, Gap, Converse, and now Microsoft. Along with all of that he's even designed his own hat line (Soji), so you won't be surprised to know that Common continues to push the boundaries with plans to launch a film production company soon. Common is currently on a promotional tour across the country promoting the upcoming release of Universal Mind Control.